According to the American Institute of Stress, 60 percent of all human illnesses and disease are caused by stress. In addition, 1 in 5 Americans experience extreme stress, which means these folks may experience heart palpitations, depression, and shaking as a result of the stress. What causes stress? For many, the usual culprits are the workplace, family issues, commuting, or overscheduled activities. But what causes stress in seniors who are not working, commuting, overscheduled, or involved with family? Loneliness and grief can be a big factor. As we age, we see friends pass on and family networks become smaller. Many children live further from their parents than in previous decades, leaving the older generation more isolated from a readily available support network. 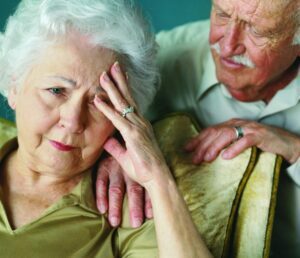 The death of loved ones can dramatically increase the stress on an elderly person. After retirement, many seniors rely on Social Security, pensions, and savings in order to support themselves and pay bills. Many find their resources are not adequate, especially if there is cancer or a chronic illness to contend with. Rising healthcare costs and pressures to pay bills on time can be a major source of stress on the elderly, who may be unable to earn more money as they age. Some seniors can keep a part-time job, work as a consultant, or create a home-based business to keep busy and bring in extra income, but not all are able to do so. Even for those who are, financial pressures can still cause a great deal of mental and physical stress that will build up until the bills are paid. Not only can the loss of memory cause stress and anxiety, but that stress can in turn speed up memory decline. In addition, loss of memory may contribute to the other stressors. For instance, forgetting that a bill has already been paid and then paying twice could negatively affect finances and cause additional financial pressure. Physical decline accompanies aging, but this decline can cause stress and anxiety. Loss of eyesight, mobility, dexterity, and more can cause seniors to feel an increasing sense of anxiety as activities are set aside. Pain and physical discomfort activate a stress response in our bodies, so continual physical pain can have an immense affect on overall health and wellbeing as well as cause stress symptoms. Retirement can sound nice, but when it finally comes around and you suddenly have too much free time on your hands, it can actually be very stressful. Most people like to feel productive and busy, and retirement is often a dramatic change from a full-time schedule to no defined schedule at all. If seniors aren’t prepared for retirement, the stress of the change may cause health issues. Prolonged stress in seniors is likely to result in a more vulnerable immune system, undereating or overeating, memory loss, inadequate sleep, increased inflammation, increased health risks in the heart and digestive system, and increased anxiety. Reducing stress and attempting to mitigate the causes is increasingly important. Read our “10 Tips for Reducing Stress” for more information. adults, anxiety, bills, caregiver, chronic pain, dementia, elderly, expenses, grief, health, healthcare, heart, inflammation, loneliness, memory, older adults, reduce stress, retirement, seniors, stress. Bookmark.